Well, it's gotten late enough in the year that things are getting pretty hectic. Despite being an atheist, I still bend to some of the holiday traditions -- sending out cards, getting presents for others, etc. I don't attach any religious significance to any of it, but it does provide a good opportunity to catch up with friends and relatives. And since it looks like several relatives will be visiting stately Kleefeld Manor this year, I figure it probably wouldn't be a bad idea to tidy up and maybe put up some decorations. Interesting thing about one's home, or mine at any rate. When my parents bought their first (and, to date, only) house back in the 1970s, it was with the decided intention that they were going to live their whole lives there. I think that was a pretty common mindset at the time. I don't know if that's nearly as prevalent today in the 21st century. Society, on the whole, is more mobile and it's not uncommon to move many times in one's life, often to entirely different states or countries. I noticed this especially when I was going through my address list and noted that many of the people I went to college with in Ohio now live scattered everywhere from Portland, Oregon to Gijón, Spain. But as I was sitting here today putting lights on the tree (still the worst part about holiday decorations, even if the likelihood of an entire string going out at once is pretty minimal) I could hear the just-above-freezing rain pattering down outside. And, despite my basement still being something of a wreck at the moment, my stuff is still safe. My comics are all dry and still organized in fact. My action figures suffer only from being picked up and moved around when I was cleaning. My holiday decorations -- many of which are Warner Brothers/DC themed -- came up from the basement completely fine and are now waiting in the dining room to be put up. This year, I'd just like you to take a moment, regardless of what religious beliefs you hold, to appreciate what you have. Maybe your biggest frustration is stringing lights on a Christmas tree. Maybe you're already sick of the incessant holiday music piped into every retail outlet around the world. Maybe you won't get to spend Kwanzaa with your spouse. Maybe you have to visit with that loud-mouthed aunt who no one in your family really likes, but she IS family. Me? I'm in pretty good shape. I'm certainly not in need of anything I don't have. Even the things I want make for a pretty short list. There are portions about the next few weeks that I'm sure I won't enjoy. (Did I mention that I don't like stringing lights?) And some things won't be optimal -- I won't be able to see my niece's and nephews' faces when they open their gifts from Uncle Sean. But you know, I can't complain. I've got a roof over my head, food in belly, and a number of friends and family out there who care for me. Many of which I'll even have the pleasure of celebrating with over the next few weeks. Happy Christmahanakwanzika to you and your family as well. 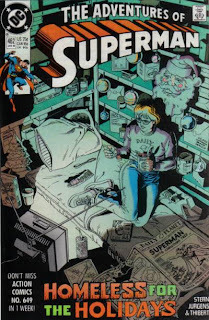 I've got the same Superman issue in mycollection. What sticks in my mind most about that issue was how that plot advanced almost without notice. 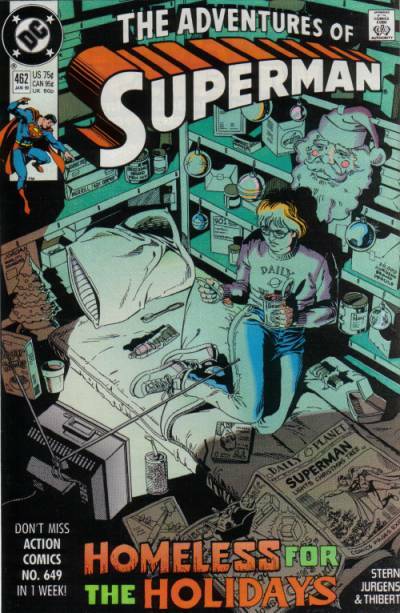 Alice was an easy to like character in the background at the Daily Planet offices. She would often joke that she lived there when anyone noticed that she would always be around no matter what time they were at the office. How shocking it was when this story revealed she was actually telling the truth.